The algorithm was relatively straightforward but there were too many steps to generate the final results. Hopefully tools such as Wordle and Tweet Cloud will evolve by providing options to generate word clouds from filtered tweets using search terms such as hashtags. 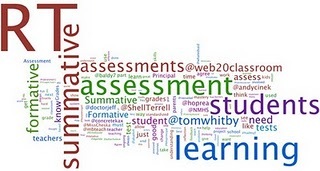 I applied a similar technique to create a word cloud of the December 16 Edchat session on assessment and sent this tweet: "http://twitpic.com/ttvn2 - Wordle of Formative and Summative Assessments transcript #edchat". Almost immediately a response tweet correctly pointed out that the Wordle missed the conversation (and follow-up reflections such as Greg Thompson Thoughts on Assessment: A Conversation). A quick look at the cloud shows RT as the "word" most often used and a LOT of @user replies. There were approximately 1068 replies and 699 retweets in the session's 1181 tweets - that is indeed conversation!